Amazon is a multi-billion-dollar company that has been around for over two decades. They stream music and TV shows, sell everything from cameras to Halloween costumes and have revolutionised reading with the kindle. They also began by selling books online. When Amazon was set up, many bookstores feared for their future. E-books then began to gain serious ground. Why shouldn’t they when they were significantly cheaper. You can have dozens of the latest titles all on a device that weighs ten ounces, which is the weight of one soft back novel. Now that same company that had digitised the book buying process, has begun to open brick and mortar book stores around the U.S. While there is an unlimited supply of book stores, Amazon feels they can offer a different experience to consumers. More importantly, they can sell differently. Using the data that they have collected over the years as an online retailer, they can choose titles that they know will sell. They have boiled your whole consumer experience, your likes and dislikes, your interests and disinterests, down to an algorithm. While Amazon has been keen to say that the data is not the sole influence in their book selections, – Jennifer Cast, Vice President of Amazon Books called it “data with a heart” –there is no doubt it will play a significant role. The stores stock approximately 6,000 titles. This is less than most book stores as they display the books face out as opposed to the traditional spine out used in the industry to give customers a better browsing experience. Do not be fooled though, Amazon has not suddenly stepped away from the online experience. The books at these physical book stores are the same price as their online counterparts, prime membership discounts included. In order to check the price of a book, you can use the app or use one of the in-store scanners. The stores are littered with a selection of Amazon’s electrical products including the Fire T.V. and Kindle e-readers. Below most titles is a review submitted by one of Amazon’s millions of users. So what does that mean for independent book stores? Some of the charm that comes from these independent book stores is the local knowledge that can be implemented in title selections. The human interaction that comes from being on the front line of selling books, dealing with actual people and seeing their browsing first hand can be invaluable for book store owners. Can Amazon’s algorithms actually compare to real, human interaction? There is the theory that Amazon can have more of an influence on publishers than independent bookstores. They are already doing it. The “Big 5”- Penguin Random House, Hachette, Harper Collins, Pan Macmillan and Simon & Schuster- in the world of publishing have been complaining about Amazon for years. Large bookstores have been negotiating what is called co-op fees with publishers for a very long time. Publishers pay these fees for more favourable product placement. In Amazon’s world this means paying tens of thousands of dollars to have their book featured on the home page. The catch with Amazon is that they are a company that is shrouded in secrecy and as they said in a statement, they don’t discuss business negotiations with publishers. In other words, publishers hand over this money without any evidence as to how this money impacts the sale of their book. 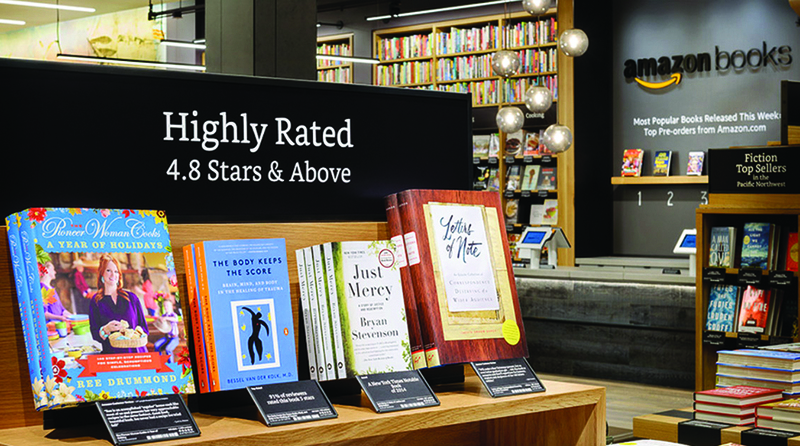 Perhaps Amazon’s bookstores can set a tone for other independent bookstores and the approach they need to take with publishers in order to increase profit margins again. You have to give credit where it is due to Jeff Bezo, Amazon’s founder. These brick and mortar book stores started popping up at a time when book sales were on the up and e-book sales were declining. According to figures released by the Publishers Association, in 2015 there was an increase of 8 per cent in book sales and a 3 per cent decrease in eBook sales. This is the first time eBook sales have decreased since the beginning of the digital age. There’s no doubt that Amazon is an all-consuming force to be reckoned with. Bezo originally named the company Relentless.com- that web address will still take you to the Amazon site today- which says a lot about the company. Amazon Book stores have been popping up around America since 2015 and there is no sign of them slowing down. In their eyes, the change in bookstores and how they operate was inevitable. Bezo has insisted in the past that “Amazon is not happening to bookselling. The future is happening to bookselling.” It seems that it is up to independent bookstores to keep up in order to stay afloat.